An accountant by profession, James Loughrey is originally from Belfast, and has played at Senior level for his home county before moving to Mallow, where he now lives. He first played football ages 7 or 8 in the back of Cleaver Avenue, and believes that the kickpass is the most important skill in football. His best football memory outside of playing is the St. Brigid's (Belfast) U12s and U14s winning the all-County title, while as a player, winning the championship with his home club has been the highlight so far. Anthony Tohill is the greatest player he has ever seen, and if there was a transfer market, he would buy Stephen Cluxton. 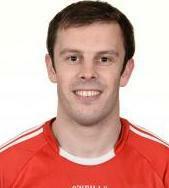 His toughest opponent has been SeÃ¡n Cavanagh, and outside of football, his favourite sport is basketball. James believes that the internet is the best invention ever, and the person he would most like to meet is GAA President Aogan O Fearghail - in Croke Park on a Sunday in September! In ten years' time, he hopes to be fit, healthy and content.